On shattering illusions, with Software Freedom Day 2012. We do not own what we create simply because we’re creating nothing. Possess and create are illusions inherited from CAPITALISM ideology. Particularly if we’re invoking KNOWLEDGE/ SCIENCE. This reminds me of a discussion I had with a doctor telling me about her patent and how certain laboratory argued about her having the patent because they were the first to put the idea into practice. While she was trying to convince me how all the members of her laboratory defend her position and her right, I thought what if both are right, everything is possible with the human brain, we’re made the same way and no one can explain how ideas get constructed within the human mind, and within the space of human ideas. So what prevents me from having the same idea as you, what makes it impossible to think the same way even we’re not sharing the same geographical situation??? Create then possess lead certainly to sell. You can tell me but what’s wrong with it? Hhhh this is because you’re very accustomed to this process of “create”-possess-sell, but are you very used with it to the point to think badly of everything given for free??? If only someone could talk me into disbelieving that there is something wrong in it, THERE is something wrong with creating knowledge, possessing it with a copyright or some stupid patents and preventing people from using it unless they buy it, unless they have money. I’m not going to discuss why “create and possess” are illusions spawned by the spirit of CAPITALISM, it’ll take a whole article ;). Instead, I honestly intend to talk you out of using/selling something that you cannot control, that you don’t know what it is exactly. To a lesser extent you don’t need me to talk you out of buying this kind of things, but let’s see…. It’s difficult to approach this subject because at the same time that I disagree with Create-Possess-sell knowledge, I’m not against buy and sell. There is nothing wrong with buy and sell, but to pretend creating knowledge and makes everything related belongs to you, possess it and prevent the whole humanity from using it unless they pay for it, this is real nonsense, and those doing it are just getting a bit paranoid. No one was born as knowledgeable person, everyone’s got to go to school or at least learn, in his own, matters that people before him have worked hard to understand and document. This discussion brings me to talk about the Software freedom day 2012 at Technopark/Casablanca where Mr.
Zannane, a speaker during the day, talked about Open Things, something like open source software, where everything is open to everyone and where an individual is aware he has a choice. For instance, digital formats, navigators, operating systems and other open source software that enable the user whoever he is, to know what’s inside, to control the behavior of the product he’s using and even to alter it. Closed formats, OS and stuff makes fun of you by buying you a closed box that you can’t even to be sure about it, whether it’s secure or not, whether it goes against your policy of privacy… Mr Zennane also blamed the government for having a policy that leave the user/the consumer with no choice, having only Microsoft product installed at the machines, the government is fooling people by making them see nothing but Microsoft products on their laptops and machines. 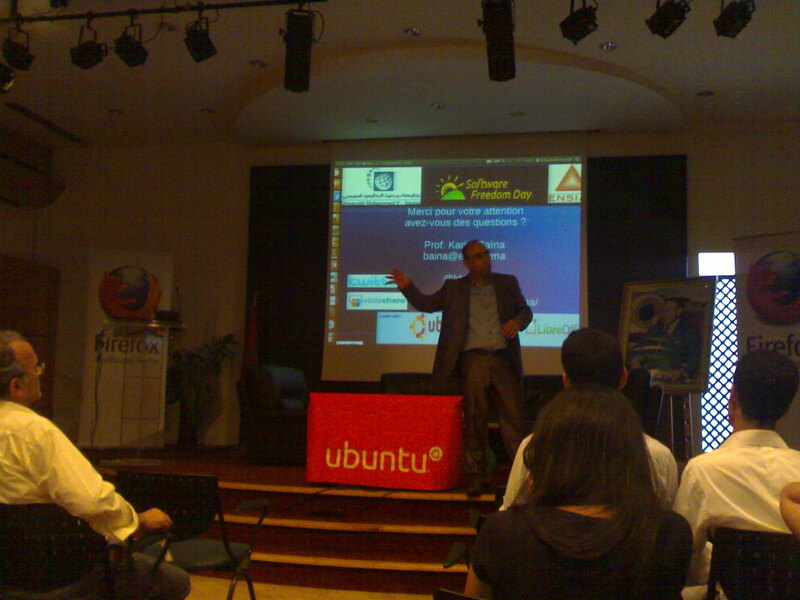 Mr. Baina, a speaker too, considers that although we’re claiming using open source solutions we’re too far from using it as an IT strategy that includes using open source solutions as the first priority when it comes to choosing a solution, while of course keeping in mind choosing the best of the best. Mr Baina giving a talk. Mr. Baina was quite explicit about the policy of “Maroc Numeric Cluster 2013” that ignores including the free and open source software, and he said: “free and Open Source Software (FOSS) is a unique opportunity for emergent countries to develop knowledge, brand equity, make foreign currency economy, and real local software industry.”using China, brazil, India and South Africa as an example to follow. And also explaining that relying only on what the Offshore brings, we’ll end up one day with nothing. 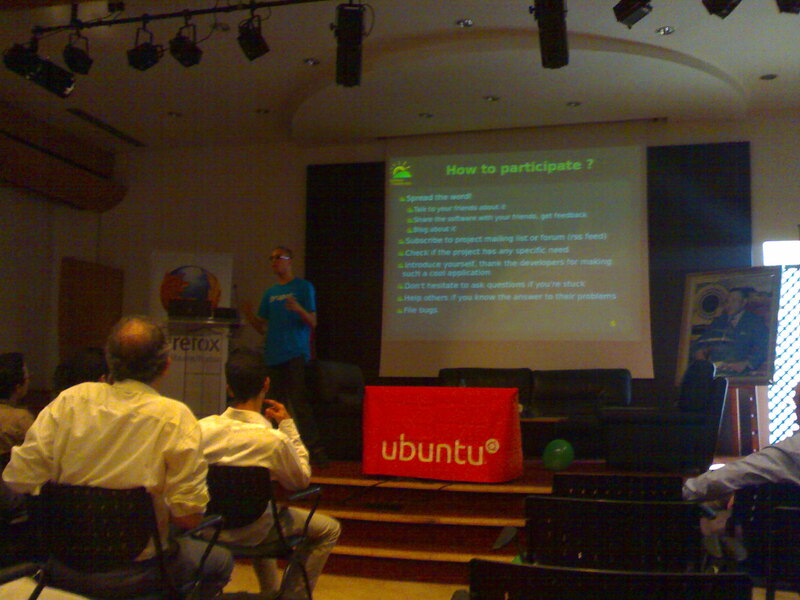 Nextma, a Moroccan society promoting FOSS, was behind the event, which is a very good thing. Especially because we’re used to contradictions when it comes to events like this, you find an event about freedom of speech prepared by the most dictator of the world, you attend to a conference about humans rights and you find it sponsored by one of the big assassinates of the world, just like with the “Peace” article of mine. But with the SFD2012 it was great and with no ideological contradictions background. I was expecting a talk by the Nextma’s CEO, Mr Elkafil, but they changed the event’s program. It was very cozy there especially with Amarochan’s use of Moroccan dialect. 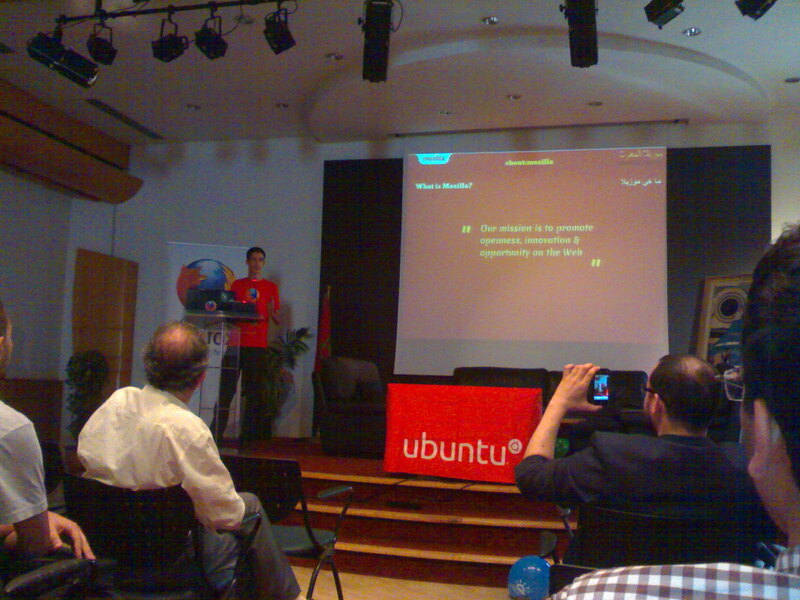 Mohamed Amarochan, from Tangier and belonging to the Mozilla community, presented Mozilla and emphasizes the difference between Firefox as a project of Mozilla and Mozilla. Many other speakers from the open source community presented projects they are working for such us OpenERP, JOOMLA, Ubunto, Archlinux and Drupal. Ayyoub Allali, the cool speaker about Drupal and one of the few Moroccan programmers working for Drupal explained how it’s easy to participate in an open source project by just doing whatever you can beginning from designing a logo to writing pieces of codes. Ayyoub’s ultimate reason to work for open source projects is having fun. Plus, it provides you with skills programmers need. The audience was very enthusiastic about FOSSs to the point that one of them, participating in the debate, demanded that persons in charge of FOSS should change their “discours sentimental” when advertising open source solutions, he added that IT managers and the government should be aware that the use of FOSS “est une solution rentable aussi”. The moral? Oh no it’s difficult to talk on behalf of the event organizer or the speakers. So I’ll say the moral according to me was that emergent countries, people, me and you, professionals and governments should face their fears and take a step towards FOSSs. That we should include working (not only if you get paid) without that obsession of POSSESS what we “produce”. FOSS is a grown solution that should earn our trust. Use open source solution and at least use a solution that you’re sure enough about its behavior. Stop this paranoia of create and possess. I’ve finally got to go through it a second time 😀 and understand it better – reading again FTW -! This Sooftware Freedom Day is as a good opportunity to learn more about software sharing as a way to gather like-minded people on such subject!